There are many benefits of outdoor lighting for your home. Lighting can make your home look more beautiful at night, increasing your curb appeal and home value. Keeping your home and surrounding property well lit is a deterrent for criminals and home invaders. Proper lighting also makes your outdoor spaces more enjoyable at night. With the right lighting, your deck, pool, or backyard is usable 24/7. It’s no secret that outdoor lighting has seen a huge burst in popularity. Once upon a time not that long ago, even luxury homes disappeared into the dark every night. Only high end resorts had outdoor lighting. At those resorts the lighting provided a beautiful tableau each night, and also served a utilitarian purpose. Keeping outdoor areas lit kept guests safe from falls and other hazards. It also made the outdoor areas of these resorts usable at night. If you are running a resort or fancy hotel, these are important considerations. But most homeowners never thought about it. Recently, that has begun to change. More and more new homes are being built with outdoor lighting right from the start. You can drive through some neighborhoods and see new house after new house with beautifully lit facades. In some cases, home builders have even lit the areas around the home. They include the backyard, frontyard, and outstanding features of the custom landscaping. But what about existing homes? Night Vision Outdoor Lighting has been working with homeowners in and around Atlanta for almost two decades. So you know that we have the knowledge and experience to bring your home up to speed. We offer a variety of full-service options to keep your home looking grand night and day. 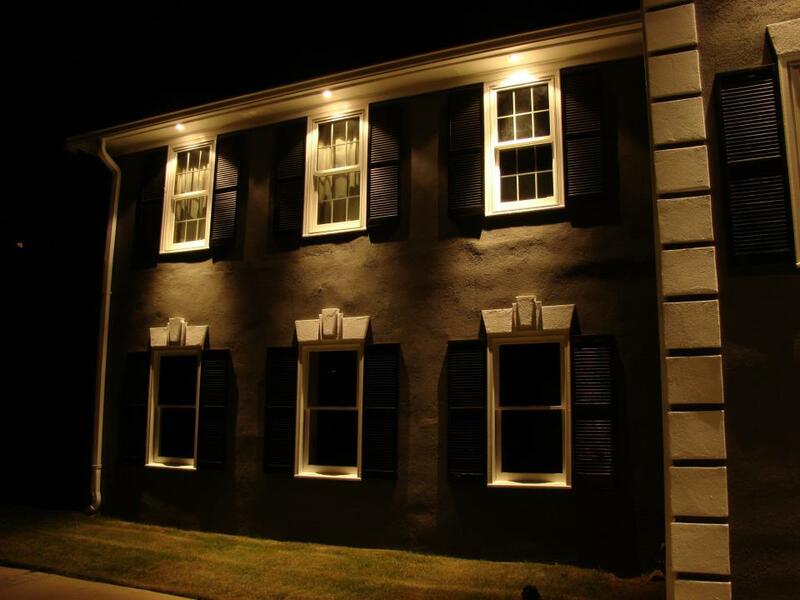 With outdoor lighting for your home, we can make your house pop every night with amazing lighting design. We will light your home’s facade, pathways, and unique architectural features, creating a resort style glow around your home. That kind of lighting increases curb appeal and just makes you love your home even more. Imagine coming home each night to a beautiful display of light and shadow highlighting your home. Our landscape lighting service takes outdoor lighting even further. We move away from your home and light up your backyard, frontyard, and the rest of your property. High quality professional lighting can give your garden a magical glow. We can install proper path lighting, illuminate special garden features, and highlight retaining walls, flower beds, fountains, and other points of interest. Your garden will be as beautiful and inviting at night as it is during the day. It seems so far away now, but it’s never too early to starting thinking about the holiday season. Come next fall, what will you be doing to decorate your home? Is the answer is that you will be untangling a pile of lights from your garage? Or will you be climbing a dangerous ladder and precariously reaching over your head with dangling electrical components? Maybe you should think again. Night Vision Outdoor Lighting has been creating some of the best holiday lighting in Atlanta for decades. We will install your lighting in time for the holidays, then after the holidays we will take it down and store it for you. What could be better or simpler! You can find out more about each of our services on our About Us page. Do you like pictures? So do we! Here are some pictures of all of our different services. One of the greatest but least noticed benefits of outdoor lighting for your home is the increased security it provides. There are many ways to protect your home. Perhaps you have a home alarm system. And maybe you have a loud barking dog, too. But there’s also a way to keep burglars and home invaders from even thinking about your house in the first place. A well lit home is a huge deterrent for burglars, home invaders, and other would be criminals. There are lots of houses out there, and going for one with proper outdoor lighting just isn’t worth it. Good outdoor lighting means that there are few places to hide and even fewer ways to reach an entrance undetected. Trips and falls are one of the leading causes of injuries that occur in and around the home. In fact, according the the National Safety Council, falls are the cause of 8.9 million trips to emergency rooms in the United States each year. Falls are most likely to occur on steps, stairs, and other uneven surfaces. Areas that are wet or slippery, such as bathrooms or wet walkways after a rain, are also prime locations for falls. Areas of the house or yard with clutter, whether it’s toys, gardening equipment, or other household items, pose a particular risk for falling. In all of these cases, the risks are exponentially greater when visibility is low. As dangerous as an uneven, slippery, or cluttered walking path is, trying to traverse that path at night without proper lighting can lead to much higher rates of injury. So if you want to do yourself (and your pocketbook) a favor, make sure that your walkways and any other area around your home where people may walk are well lit. Good lighting will help you, your family, and your guests easily maneuver around dangerous obstacles. And besides being good for your health, it’s good for your wallet.The last thing you need is a costly trip to the emergency room or an expensive insurance claim or lawsuit. Outdoor lighting isn’t just useful for keeping you safe. Those are nice side benefits. But perhaps the biggest benefit is the extra use you get from your outdoor spaces when they are properly lit. Sitting in a dark garden at night might be a little weird. But spending a time in a beautifully and appropriately lit garden at night can be magical. It’s amazing how just a bit of strategically placed landscape lighting can add a whole new living space to your home. The same is true for outdoor areas like decks. A deck may get some light from a simple deck light or from light that shines out of the house itself. But once you get your deck properly illuminated, you will wonder what you ever did before. Adding the right amount of light to your deck and putting it in the right spots can make using your deck at night a great new option. Whether you are just hanging out enjoying the evening air or hosting an all out house party, your deck will take on a new life. Outdoor parties like barbecues and cookouts can smoothly continue well into the night without the need to head indoors for light. If you’re hosting a party in your home, having good deck lighting will give your guests an extra space to spend time. If you have a swimming pool, maybe you’ve thought about some night swimming. If you have the right lighting, that sort of activity makes a lot more sense. Lighting in and around your pool can make your pool a 24/7 attraction. So go ahead and take that midnight dip! Are you looking for an easy home upgrade with a great return on investment? Adding outdoor lighting to your home has so many benefits that it’s obvious why so many people are doing it. Let Night Vision Outdoor Lighting be your guide to find out how outdoor lighting could benefit your home. Just drop us a line on our contact page and we will be happy to set up a free consultation.